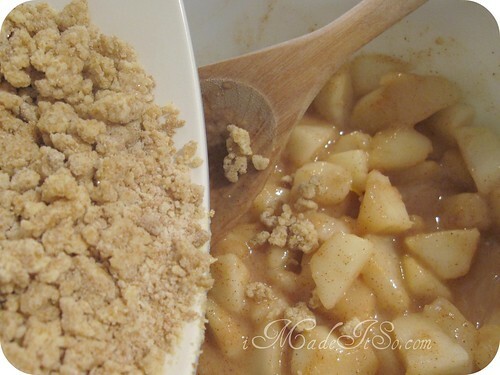 easy recipe: pear crisp | i made it so. the recipe is directly from kraft.ca and i only modified it slightly (used less sugar, more lemon, omitted whipped cream). we were recently gifted a basket full of beautiful home-grown organic pears, fresh off the tree. preheated oven to 375 F / 190 C.
added pears, lemon zest and juice and tossed til pears were coated. 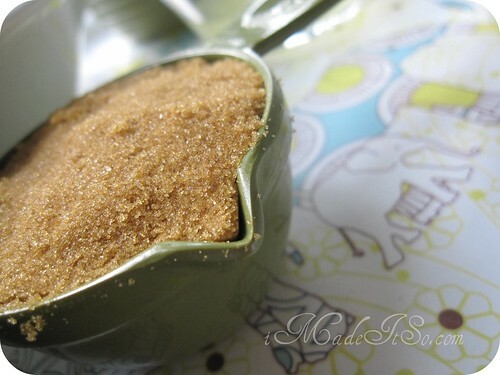 in another bowl, mixed brown sugar, remaining granulated sugar, flour and cinnamon. cut in butter (i used two knives, but a pastry blender would work too) til it formed coarse crumbs. 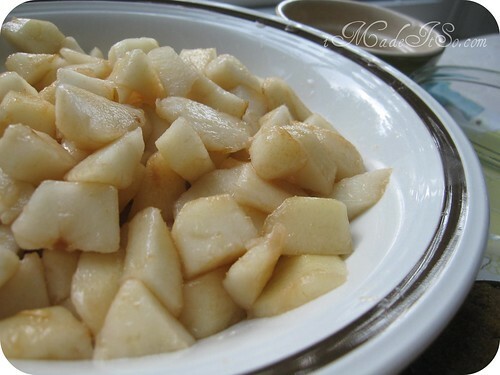 sprinkled this mixture over the pears. the lemon makes the recipe! it gives it a subtle tart edge. 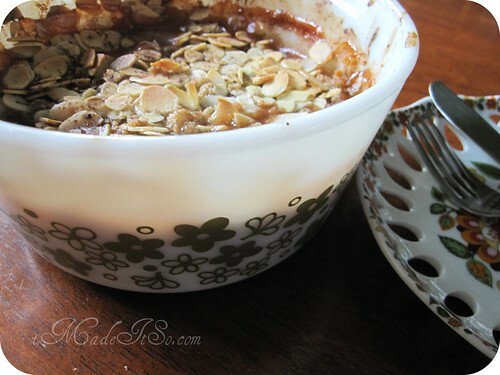 the almonds add texture and are so flavourful when toasted. i could probably have used even less, it came out quite sweet. delicious though. i think it would go very well with a dollop of vanilla ice cream. you know…since i cut back on the sugar and all. 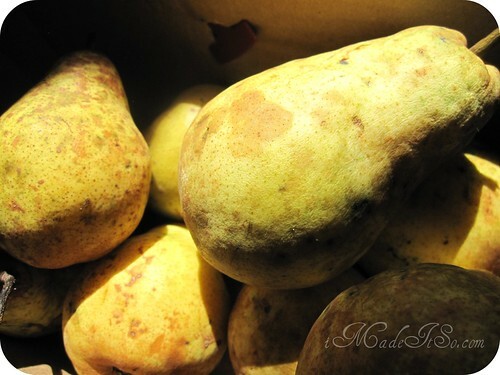 pears are in season here, and i think i’ll be going to the farmer’s market this weekend to see what else is fresh and available. i love this time of year for the market. and for family with generous trees! 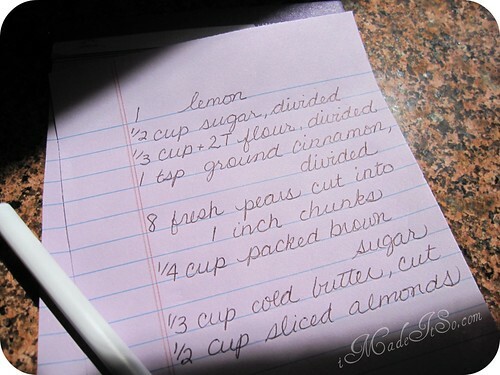 This entry was posted in in the kitchen and tagged crisp, crumble, dessert, pear, recipe. Bookmark the permalink. I agree! 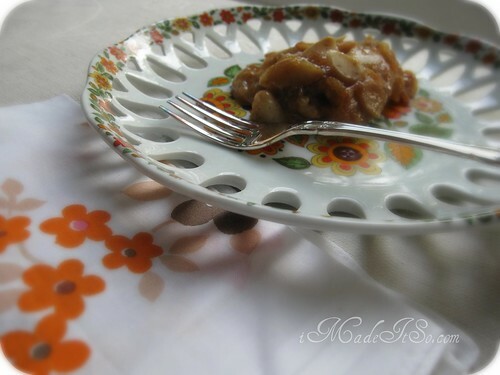 I love the vintage pyrex! Thanks so much for sharing the recipe and I really like the idea of cutting back on sugar too … (butter no way heehee) … I am now officially very hungry … thank you Ana! That looks delish! I’ve not had a pear crisp before. I turned our pears into fruit butter (it’s an addiction) but I’m hitting the market in the morning and hoping there are still pears to be found! Can I come over and try some? Oh, you’d better lock away that Pyrex bowl first, I do not have that one in my collection…. hehe. This looks sooo delish! The plate in the last picture is so pretty and unusual, where is it from? Pingback: bright floral dish made in brazil | i made it so.